Janet and I walk 2 to 4 miles every day that we are home. We like to say that it is our medicine but it’s always a lovely time together. Last week while walking, we noticed someone had dumped a whole truck full of junk on our street — a broken TV, old furniture, etc. I looked through it and sure enough I found the creep’s address among the trash. After taking pictures of the mess they have made on our country road, I sent them a letter. I told them what they did was not only illegal but also rude and very inconsiderate. In the letter I sent pictures of what they had dumped and the box with their address on it. Included in my letter was a warning to pick up their trash within 48 hours or I would take all the information, the pictures and their address to the sheriff. 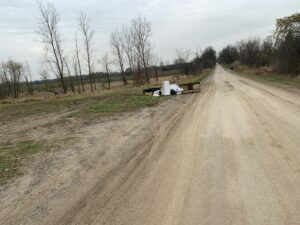 We went out for our normal walk again yesterday and found the trash had been re-collected and the area on our road cleaned up. Too often we turn a blind eye to such things, but not me. I believe in the biblical concept of right and wrong and justice. It’s a good idea that we hold people accountable for their inconsiderate and illegal actions. 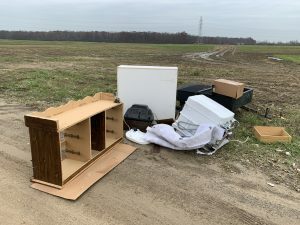 We have the same problem here in Oregon with lots of public access onto logging roads with dump sites of illegal trash. I still shudder when I think about those moments and what legal nightmare would have ensued had the trigger been pulled, but had my son not acted in that manner, I am absolutely certain that I would have attacked. I am a firm believer for weapons in the hands of the just, and thank God for sinister-looking black assault rifles!